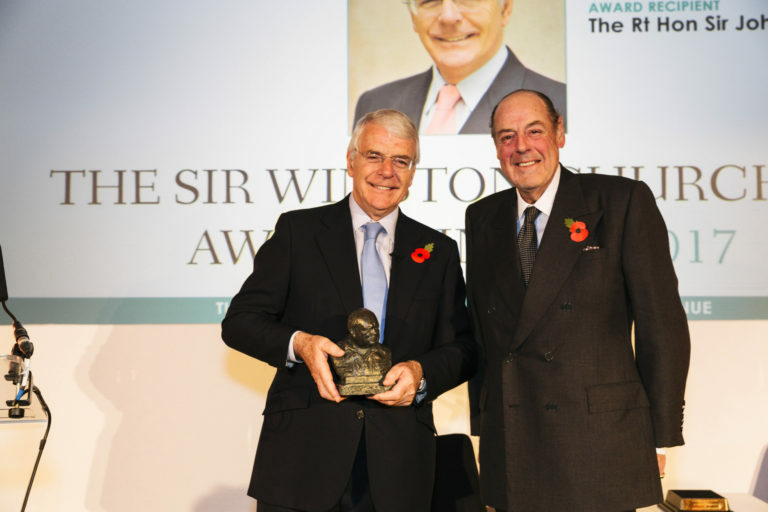 The Sir Winston Churchill Award 2017 was presented to The Rt Hon Sir John Major KG CH. The dinner is a celebration of the charitable work of The International Churchill Society (UK) and was attended by members of the Churchill family, the Trustees and Patrons of the Society and their guests, and by business leaders and their guests. The bust of Sir Winston Churchill in his wartime siren suit, was created by Oscar Nemon to evoke Churchill’s leadership and determination. The bust is hand cast for the Nemon Estate from bronze resin, and finished with a verdigris wax patina used in Nemon’s lifetime. The award is given to a person who promotes, sustains, and exemplifies Churchillian values and recognises and honours achievement in those fields of public life and personal endeavour in which Sir Winston Churchill played a role or took an interest. It was introduced and presented by Sir Winston’s grandson, Sir Nicholas Soames, an ICS (UK) Trustee. Past recipients of the award have included: General Sir David Richards, John Simpson CBE, HRH the Prince of Wales. All the proceeds from this annualevent are used to support the charitable programmes and the day-to-day running of the Society. These programmes currently include a national public speaking competition for secondary schools in partnership with the English-Speaking Union, regional public speaking competitions at Chartwell and Blenheim Palace, a global design competition in partnership with the Pentland Group, the delivery of online teaching resources into UK schools, sponsorship at the Chalke Valley History Festival and the continued development of the Society’s digital resources.